In terms of our everyday, moment-to-moment, experiences with the S9+, we were mostly satisfied with the performance it deliver. For the most, things were as silky smooth as you expect from a flagship like this. However, the device did occasionally stutter or lag when we got into the double digits in terms of active applications. In order to keep things running smoothly, it felt like I was constantly checking to make sure extraneous applications weren’t running in the background. 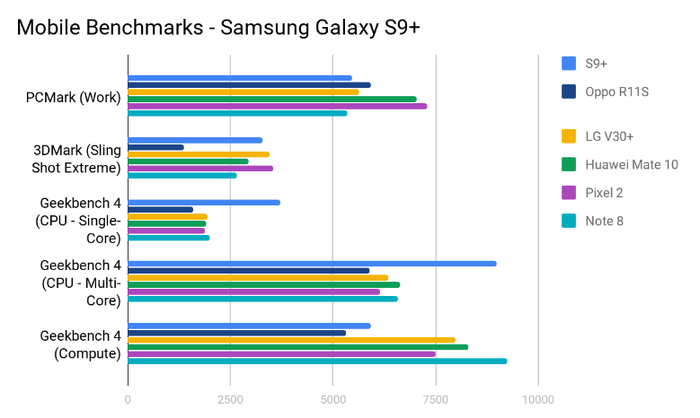 Looking at the benchmarks below, Samsung’s own Exynos 9810 octa-core processor does deliver some significant gains in Geekbench’s CPU test. However, these gains aren’t nearly as strong when it comes to both the FutureMark and Geekbench’s Compute tests. As with the Note 8, I came away slightly-irked that Samsung have opted for their own internal solution over the Snapdragon 845 when it comes to markets outside of the US. Still, the S9+ is a flagship device when it comes to specs and, again, it does deliver more-or-less exactly the kind of flagship-grade performance you’d expect it to. Unfortunately, those expecting it to blow away outpace the Snapdragon-powered competition may be a little disappointed by the reality. One aspect of the hardware that Samsung haven’t really messed with is the battery. Overall, it’s pretty comparable to most flagships. I could make it through an ordinary 9-hour work day. However, I definitely needed an afternoon top-up to make it through anything longer than that. Obviously your mileage is going to vary here depending on how heavily you film or watch video content etc. In the PCMark Battery Test, the S9+ took 9 hours and 9 minutes to go from 100% to 20% battery life. It also helps that the Galaxy S9+ does come with all the requisite perks. It supports Quick Charge 2.0 and even faster wireless charging. Whether or not it qualifies as the fastest option on the market is another matter, but it holds up as a pretty compelling package anyway. 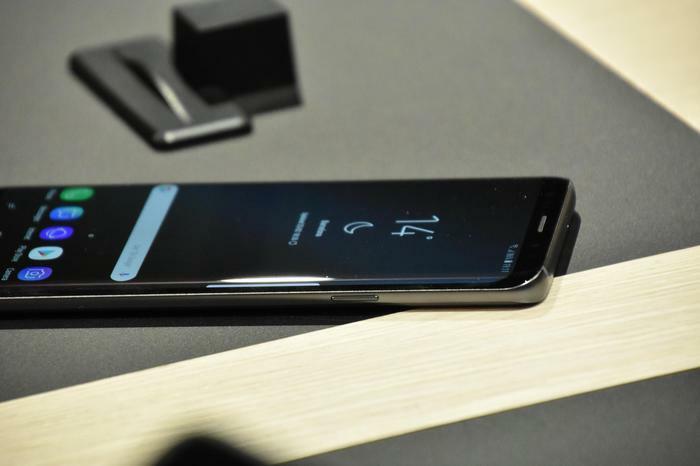 In a world where Apple has just redefined what an iPhone looks like with the iPhone X, Samsung have come out swinging with a product that looks far too close to what they came out with last year. Even if the moment-to-moment experience of using the Galaxy S9+ is every bit as solid as its predecessor and the new camera does cut a sharper silhouette, it rarely feels like the kind of triumph that a Galaxy flagship like it probably should feel like. That said, if the contract on your current handset has just run out, the Galaxy S9 and S9+ are a pair of super-compelling options worth considering. Unless the biggest additions to the formula here - AR emojis, the variable aperture lens and super-slow-motion - sound like a slam dunk for your specifically, it feels difficult to hail the S9+ as the same kind of slam-dunk that the S8 and Note 8 were. 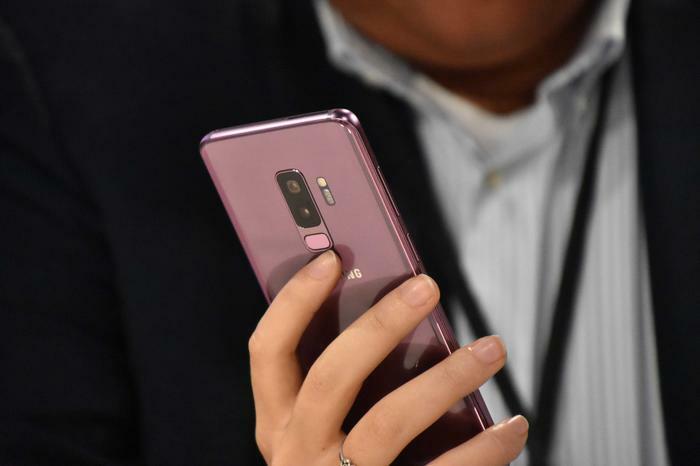 It’s a great phone - but not one that’s likely to meaningfully contribute to Samsung’s legacy of releasing products that push the industry this way or that - and when you’re as big of a brand as Samsung is, isn’t that the whole point of a flagship?